To test the performance of the Asus HDAV 1.3 Slim I played a large variety of music from my eclectic collection, including playing CD's and extracting high quality FLAC recording from several CD's. I have tried to cover a large range of music genre's to ensure I tested all aspects of the sound coming from the card. Note I also listened to normal MP3's and AAC compressed tracks to ensure I portrayed a 'real world' situation. Note that being a totally digital card, I could only output music through a digital out into my Yamaha DSP-AX863SE. I did listen on headphones connected to the AV Receiver as well to ensure I wasn't missing out testing, however. It is worth noting that this means that all listening with the HDAV Slim was performed using the awesome Burr-Brown 192kHz/24-bit DACs that reside in my Yamaha DSP863SE, rather than any onboard DACs on the card itself. 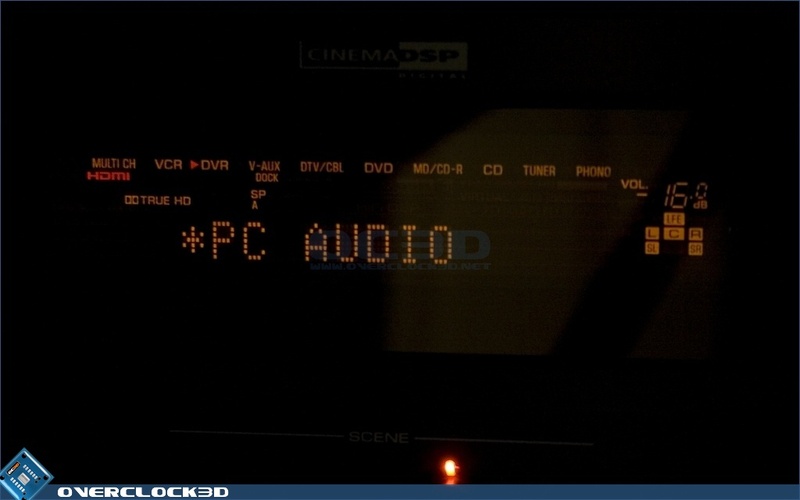 • The 'core' DTS or Dolby Digital audio stream on the Blu Ray disc. Digital Sound from the Asus HDAV 1.3 Slim was good quality and clear throughout all my listening. Using 192KHz PCM for music, the card output a plain un-fussy sound that had a good amount of detail in it. I've found PC sound cards can be a little lacking in bass detail using digital out but the HDAV 1.3 Slim didn't seem to suffer too much from this. It's worth noting that the music quality from the card didn't have that something extra that was present in the Essence STX in bundles, and there to an slightly lesser extent in the Auzentech X-Fi Forte. Whilst the Burr Brown DACs in my Yamaha AV Receiver did make the sound full and detailed, the previously mentioned cards made music just that little bit more pleasant to listen to. 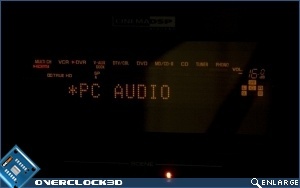 With the Asus HDAV 1.3 Slim passing Dolby Digital or DTS sound straight into the Amp using ArcSoft TotalMedia Theatre, DVD is a good test of the card. Sound quality on DVD was excellent. The card passed through the surround sound to the Amp perfectly and positioning was spot on. Explosions were big, shards of glass went flying around me and voices were clear. Now for the important bit and what you (most likely) have been waiting for. Did the Asus HDAV 1.3 Slim pass High Definition audio, unaltered, to my High definition ready Av Receiver? If you'd care to look at the two images above, top left corner, you'll see that the Amp was receiving proper unadulterated HD Audio. I even got a spare set of speakers hooked up to prove that 7.1 was present, where available on the discs and had no issues at all. HD Audio is all it is cracked up to be with gorgeous sound positioning, spectacular back-pounding explosions and precise positional audio that really immerses you in the film 'experience'. Owning two stand-alone Blu Ray players and a PS3 I know how it should sound and am 100% confident that the Asus HDAV 1.3 Slim is doing nothing to the sound. Whilst that doesn't sound hugely impressive, it is exactly what the doctor ordered and exactly what the card is designed to do. As such, the HDAV 1.3 slim gets top marks in the film part of this review, surpassing everything we have reviewed before. The Asus HDAV 1.3 Slim also passes the HD picture to your monitor or TV via HDMI. It does this by taking the HDCP enabled picture from your graphics card via DVI-D, adding the audio and outputting all through an HDCP-enabled HDMI port. To briefly test picture quality I simply compared the picture directly from the DVI-D port of my graphics card to the picture from the HDAV 1.3 Slim. I then input this into both the Panasonic TH-42PZ80B Plasma TV and my Dell 2407WFP LCD Monitor. The picture signal was exactly the same when compared between the sources and screens, which is excellent. It is worth noting that it does take some of what can only be described as 'fiddling' to get the picture right from my graphics card onto the TV, but I got there in the end and it was worth it. At this point I want to try and describe what I mean above by 'fiddly'. Getting music from the HDAV 1.3 Slim requires that the HDMI output from your graphics card is on. 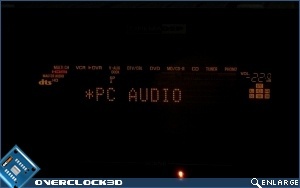 This means that for users like me who like to have the TV as a secondary source, your AV receiver must be on and the output enabled in the Nvidia (or ATI) control panels for the sound card to output audio. Whilst this would not be an issue for a dedicated HTPC sound card, it does mean that if you wanted to listen to some music without a TV on, you'd have to set the sound playing, then switch off your TV, leaving your Amp on. On a related note, being a purely digital card means that you MUST have a sound processor of some sort. This will not be an issue for those who are in the market for this card to use as an HTPC, but please note this if you are thinking of buying it in a more casual capacity. The sound quality on the Asus HDAV 1.3 Slim really is very good. Music is detailed and clear with good depth, if lacking a little something added by the DACs of some previously reviewed cards. 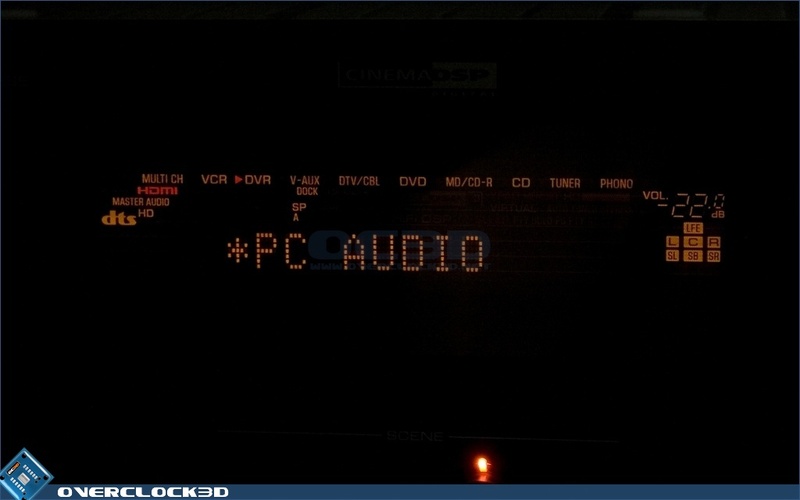 Movie sound quality is fantastic and no matter what format you pass the sound into an external source, it is very good. Picture quality is also excellent and matches the source it is being taken from so no quarels there.